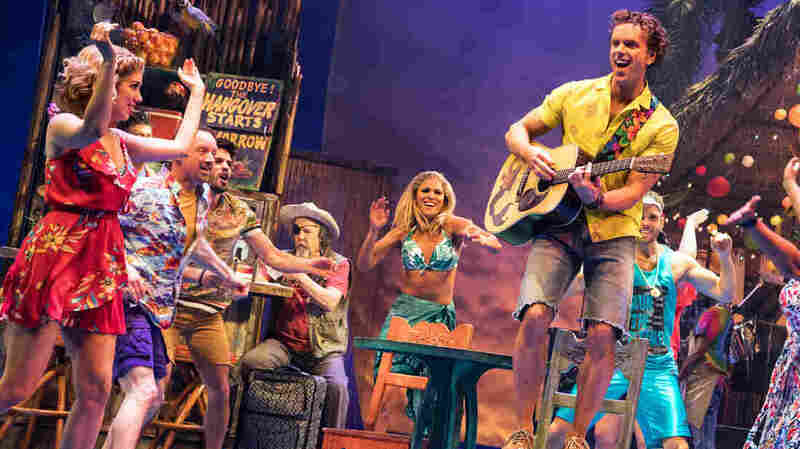 How Jimmy Buffett Brings 'Margaritaville' To Broadway The enterprising beach bum's Broadway play opens this month. It may be a jukebox musical, but for Parrotheads, it offers a welcomed escape. A scene from Jimmy Buffett's Broadway musical Escape to Margaritaville. In the balcony of the Marquis Theatre on Broadway, Jimmy Buffett watches the final rehearsal for his new musical, Escape to Margaritaville. Down below, technicians inflate beach balls, which, in true Buffett fashion, are to be dropped on theater-goers' heads at the end of the show. The title of the musical, of course, references Buffett's most famous song, "Margaritaville." Like its namesake, the musical is about a beach bum who lives on a tropical island, playing the guitar and singing for tourists covered in oil. To hear a full Broadway cast perform his music has been a dream come true for the musician. "I still can't actually believe this is happening sometimes," Buffett tells NPR's David Greene. "It's been a long road." In a musical made for his fans, also known as Parrotheads, it was important to Buffett to have Parrotheads put it together. "I had to have people that understood the culture," he says. "There were great writers who write for Broadway exclusively that really were interesting and I like their work, but none of them were real Parrotheads." Jimmy Buffett has been performing for Parrotheads since the 1960s. The Mississippi native began as a country singer in Nashville, but after moving to Key West, Fla. in 1972, he built a career celebrating the beach bum lifestyle, playing bars and trying to get his name spelled right on T-shirts. Back then, he lived an easy-going lifestyle, concerned only with nibbling on sponge cake and watching the sun bake. It wasn't always that easy, though. In college, Buffett lived in a trailer with his bandmates. "We were living hand to mouth daily, and it came to the point where we couldn't pay both the gas bill and the electric bill," Buffett remembers. "So, we only paid the electric bill, and we spent money on electric blankets, and we lived with extension chords and electric blankets while we rehearsed." Today, Buffett is a busy multi-millionaire. Parrotheads fill stadiums, some wearing cheeseburger hats. Buffett markets everything he sings about, from blenders to lost shakers of salt, and of course, his restaurant chains. But he always stays true to his fan base. "I'm not Ron Popeil," he says. "I can sell you a blender, but I'm not going to sell you a Veg-o-matic." Some interpret his enterprising as too commercial. Buffett insists his success has been less about marketing and more about learning to meet the demand for the "feeling that you need to get away." He describes Parrothead culture as an indulgence in escapism. "It's fun, and [it's] getting away from the rigors of real life," he says, acknowledging the demand for his music to provide relief. "These days, I think we need it more than ever." Jimmy Buffett's music, like his jukebox musical, isn't for everyone. Buffett doesn't just admit this; he's proud of it. He says he simply makes music for his audience, the paying customer. 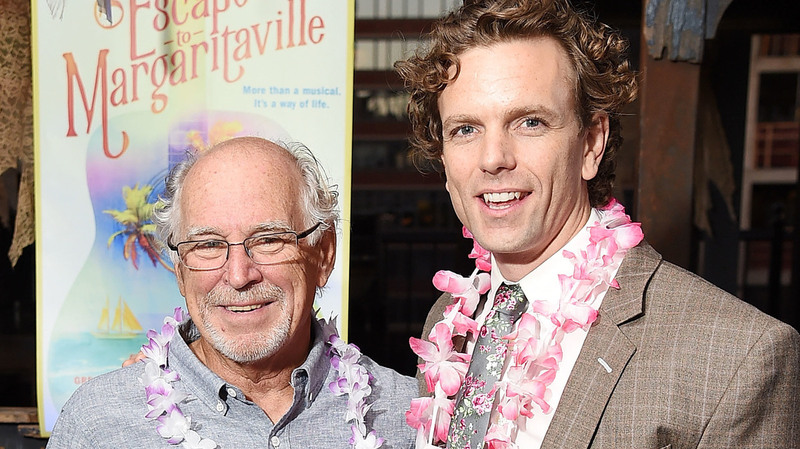 Jimmy Buffett and actor Paul Alexander Nolan at the Escape To Margaritaville send-off party in New York City in Sept. 2017. Escape to Margaritaville doesn't have an intricate plot. Buffett and his writers essentially threw just enough plot lines into a blender to get from one Buffett hit to the next. Even so, when the musical opens March 15, Buffett knows Parrotheads will come flocking. The singer sees his own musical future that way, too: hopping from one tour destination to the next, only pausing to get his hands on a frozen concoction. At 71, Buffett plans to keep going as long as he can have fun and hit the high notes. "I'm looking up the road and at 75 you got Sir Paul [McCartney] and Mick [Jagger] and then at 80 you got Willie [Nelson], and at 91, Tony Bennett," he says. "So I'm not going anywhere, except up that road as long as I can." Hear the full conversation with NPR's David Greene at the audio link.